I thought I would attempt to do a series on Ramen Noodles while in New York. My original plan was to hit Momofuku Noodle Bar, Totto Ramen and Ippudo New York but due to lack of available time I could only check out the first two but I think this is enough to make a good comparison. I had to check out David Chang's Noodle Bar. Even though it was a hot hot day in Manhattan and after walking about 3 miles from Soho to East Village, it really wasn't appropriate weather to have a hot bowl of ramen but I persevered. By arriving quite late in the lunchtime session, I managed to get a seat at the counter rather quickly. 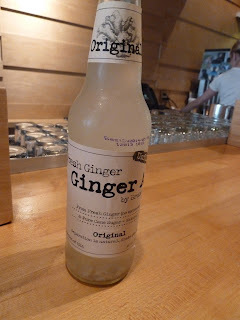 Fresh Ginger Ale - I loved this drink. It really had a great ginger flavour and if I could take a carton of it home I would! Pork buns with hoisin, scallion and cucumber. This dish was the highlight as far as I am concerned. The pork was so tender and literally melting in my mouth. The savouriness of the hoisin sauce together with the crunchiness of the cucumber slices offset the tender pork beautifully. I now understand why everyone raves about these pork buns. Momofuku Ramen with pork belly, pork shoulder and poached egg. Admittedly I did struggle to finish this dish. Only because I was feeling quite full by then but I persevered. The pork belly was tender and the egg was perfectly poached but I found the broth slightly salty. However I did like the texture of the ramen, it had a nice bite. A close up of the beautifully poached egg! Dishes to try next time: Soy sauce eggs and Smoked Chicken Wings! This place is obviously very popular and there is a high turnover of diners walking in, having a quick meal and leaving before the next lot repeats the process. I was trying to work out when and how I could fit in a quick lunch at Totto Ramen in the midst of the very busy itinerary that Sami had set for the group. Saturday morning was free and I took the opportunity to firstly check out the beautiful New York views from the Rockefeller Center and then dash over to the west for some ramen. 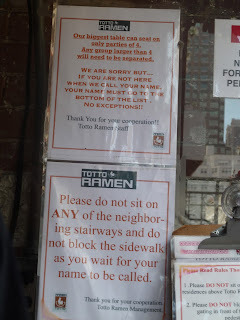 By the time I got to Totto Ramen that Saturday it was about 12.20 pm. The tiny restaurant opens from 12 noon. There was already a queue and I worked out that I had to write my name down on the clipboard (located at the restaurant's main entrance) and they would call out the name when the required places are available. If it so happens you are not around when your name is called, you will miss your turn and when and if you return you join the queue all over again. On top of that, it is a cash only business so please come prepared. After waiting patiently for 40 minutes, I got my seat at the counter. Yay! I chose the Chicken Paitan Ramen which was cooked in a chicken broth and I included toppings of a Seasoned Boiled Egg and Bean Sprouts to my order. No words can describe how utterly delicious the broth was. The paitan broth was the star of the dish, the depth of flavour was amazing! I was bowled over by my extremely delicious lunch. The ramen itself did not have the same bite as that which I had at Momofuku, it was slightly softer in texture. But overall as a dish, Totto Ramen's dish was the outright winner (in my humble opinion).